As we age, the elasticity of our skin diminishes the fat and supporting tissues of the lip decrease and loss of lip volume occurs. This results in lips becoming thin, narrow and losing their projection. Lip enhancement can be achieved in different ways. The simplest and most common method is by using injectable dermal fillers. 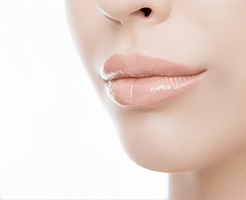 Dermal fillers can augment the border of the lip as well as the volume or fullness of the lip. The procedure is done by Dr Safvat, not a nurse in the room. You will be allocated 30 mins for the lip enhancement procedure. The actual injections only take a few minutes but most of this time is used for assessment, explanations, preparation and planning. Lip Dermal Fillers usually last around 5 to 7 months after the initial procedure as there is a lot of movement in that area. Dr Safvat only uses Temporary dermal fillers made from Non Animal Stabilised Hyaluronic Acid (NASHA) which is a clear gel made from a purified sugar complex that occurs naturally in our skin, and is absorbed safely and effectively.These dermal fillers are safe as they contains no animal proteins, allergens or chemicals, and in rare circumstance that they are not needed anymore, they can be reversed. The results after you’ve been injected with lip fillers will be immediately evident, although final results might take up to a week. There may be mild swelling and temporary numbness, but this will soon subside. Normal activities can be resumed right after treatment. Dr Safvat ensures Lip enhancement is done in a subtle and natural looking way, and that your lips don’t appear fake or have an over-done look. Another more permanent option for enhancing lips is Fat Injection (transferring some fat from another part of the body to the lips). Results in this technique last longer but can be unreliable as some of the injected fat will be reabsorbed in time. Dr Safvat recommends patient start with the Temporary dermal fillers, and if they like the result and want a more permanent solution then opt for fat injection.